The 3-day course focuses on industry specific topics related to electrical applications, this was followed by a presentation into IRISS’s award winning “Infrared Windows” “Delta T Alert” a 24/7 online temperature monitoring system of your critical power. Many Industries, such as Data Centres, Process plant & Manufacturing are adopting rigorous Infrared Inspections to ensure the safety of personnel, facilities and equipment. 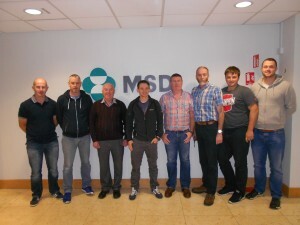 Read the testimonial given from our client MS&D & includes picture of attendees…..
Level 1 Thermal Imaging training MSD. Ballydine Sept 13/14/15. Paul’s methods and course content were perfect for our requirements. Some of our students had no previous knowledge while others were somewhat familiar with the basic principles of thermography. Paul delivered this training in a manner that took this into account and all present were more than complementary. A wide range of cameras were available to all so there was a machine for all to get hands on experience. This was hugely beneficial as “doing” to my mind is the best training of all. Simple experiments were provided to demonstrate the finer points of thermography. The theory was delivered in a way that was informative, interesting and explained in an everyday style that all participants could readily understand. We will have more people for training in 2017, and I am looking forward to Paul’s return.